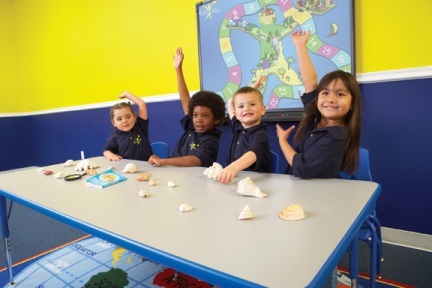 FasTrack® Advanced Discoverers focuses on the development of creativity, communication, confidence, critical thinking and collaboration skills for older toddlers through an exciting, teacher led interactive program. Part of the program is dedicated to growing a student’s knowledge of both mathematical and language arts subjects. Students receive individualized instruction in both math, reading and writing. The path to discovery in this enhanced FasTrack® Discoverers program includes our world-class child-centered Math Tutoring & Enrichment and Reading & Writing Tutoring & Enrichment programs. An interactive, multi-day program targeted for children entering pre-K 4 in NYC indulges their natural curiosity while growing math and language arts skills. Students “discover” for 3 hours a day, 3, 4 or 5 days a week for 38 weeks. FasTracKids Advanced Discoverers is a STE(A)M based learning program. With up to 11 different activities during a day, FasTrack Advanced Discoverers students are exposed to Educational Zigzagging℠. This method allows children to gather information through exposure to visual, auditory and kinesthetic learning, meeting the needs of various learning styles. Elements that can be found in the FasTrack Advanced Discoverers program include: Welcome Time (transition and socialization), Welcome Circle (creative expression), Language Arts & Handwriting (workbook based), FasTrack Learning Station® (science and creativity), Snack Time (socialization), Movement (gross motor skills), Academic Stations (language, literacy and math), Music Time (FasTrack Music), Creative Time (culture and art), Mathematics (workbook based) and Closing Circle (creative expression).